THE WOODLANDS, Texas – Inland Pipe Rehabilitation (IPR), the nation's largest privately owned trenchless infrastructure solutions provider, recently installed Cured-In-Place Pipe (CIPP) to renew more than 1,600 ft. of water lines serving a North Dallas suburb water treatment plant. IPR installed its unique pressure pipe renewal system provided by RS Technik using Dow custom formulated resins. IPR invested in the new NSF certified technology a year ago and since that time has been training its crew, going through proper approval channels, conducting demonstrations and securing pilot projects. "Overall, we are pleased with the progress we've made with our new installation system," explained Joe Cutillo, President and CEO of IPR. "The average age of a broken water main is roughly 45 years and it's estimated that nearly 25% of all water mains are older than 50 years. Since most piping systems were only designed for a 50-year lifespan, the frequency of failures is going to increase significantly in the very near future," he added. Until recently, conventional dig and replace was the only sure way to repair a damaged or broken water main. However with the development of the RS Technik System, combined with the CIPP installation experience of IPR, water mains can now be relined and leaks can be repaired, before a line completely ruptures. "This represents a significant cost savings to cities and towns across the country," said Mike Vellano, Vice President, Sales and Marketing for IPR. "Our new system is extremely sophisticated, structurally restores the existing pipe and safe for the environment." In addition to industry approval, this unique fully structural solution is designed to sustain long-term internal pressures and external loads of the existing pipeline. Unlike traditional CIPP, the RS Technik process includes a computer-controlled, mobile wet-out and mixing unit. This results in a faster response and consistent higher quality, with professional installation. Now that IPR's water main rehabilitation system is available, water districts have begun to take notice and are more seriously looking at relining their CIPP water and transmission mains as a cure to their problems. "CIPP relining has been around for a long time, and has proven itself as a cost-effective, and non-disruptive way to rehabilitate sewers," stated Jim Rorison, IPR Chief Operating Officer. 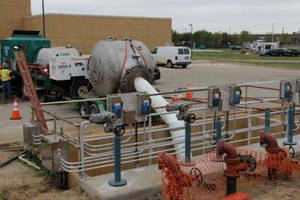 "We knew it was only a matter of time when the process migrated into the drinking water market. And when it did, we wanted to be a part of that, but not before we know we had the right system to conduct a permanent and safe repair." The response to the new system has been very positive and backlog is increasing. "We have several major projects coming up later this spring and summer," added Rorison. IPR is a national leader and provider of underground technology solutions with offices in six states throughout the United States, including CA, GA, FL, MI, TN and TX. Licensed in all 50 states, IPR uses the latest technologies in the industry – placing high emphasis on trenchless and environmentally friendly pipe and infrastructure solutions. For more information, please visit www.teamipr.com. RS Technik is a global leader in trenchless rehabilitation solutions. Their signature systems, RS CityLiner® for gravity sewer repairs, and RS BlueLine® for pressure and water pipe system renewal, feature specially formulated DOW™ resins and highly sophisticated mobile units with computer-controlled impregnation. Combined with custom manufactured felt and reinforced liners, these critical elements make up the most advanced and eco-friendly CIPP systems in the world. More information about RS Technik can be found at www.rstechnik.us. Conveyor-Belt Fasteners extend splice life.